The Amulet PowerClamp hydraulic thumb offers superior performance for a variety of demanding jobs encountered by municipalities, logging crews, general contractors and demolition professionals. Featuring heavy-duty hydraulic cylinders, low-wear serrated teeth and high strength steel alloy construction, the PowerClamp is built to last. PowerClamps are available in 140 degree non-linkage and 180 degree linkage models and are additionally available with or without quick couplers. The unique universal design of the Amulet PowerBrute provides an inexpensive, solidly built hydraulic thumb that fits most makes and models of machines old and new. Featuring an independent main pin and universal two-tine design, the PowerBrute allows for quick and easy bucket changes. Amulet offers the Best Rigid Universal Thumb - B.R.U.T. for an excellent alternative for contractors looking for a thumb that is heavy duty in design and easy to use. Built to excel in demolition, rip rap, land clearing, scrap, etc. the CT Series thumbs are designed for those who do not require the independent control features of mechanical HoeClamps or custom configured hydraulic PowerClamps. When not in use, all CT model thumbs are designed to store as complete units tightly against the stick. Amulet's severe duty NT series rigid Nitro thumbs are now available for base machines ranging from 20,000 - 100,000lbs.. With it's unique multi-tine design, independent main pin and wide range of operating positions, the Amulet Nitro Series thumbs are ideal for demolition, land clearing, as well as scrap and log handling projects. The Amulet HoeClamp is a quality built, pin-on, full motion thumb that fits most standard and extendable stick backhoes up to 30,000lbs. Operated by bucket curl using Amulet's patented kidney link design, the HoeClamp requires no additional hydraulics on the backhoe. With the ability to grasp, dig and be stored away when not in use, the Amulet HoeClamp is a must for ultimate backhoe versatility. 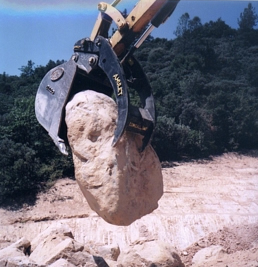 For construction, rock handling, land clearing, demolition and excavation projects, the HoeClamp cannot be beat. The Amulet HoeMate rake is the ideal heavy-duty match for any type thumb attachment. Available to fit virtually all machines to 80,000lbs. the Amulet Rake creates an unsurpassed open tine grapple. Replacing the bucket, the HoeMate, used in conjunction with any of Amulet's rigid, mechanical, or hydraulic thumbs is an inexpensive way to create a grapple in just minutes without the investment of limited-use, dedicated clam or "orange peel" grapples. The Amulet Rake can easily handle everyday applications up to and including extreme-duty jobs such as demolition, boulder and log handling projects. Perfect for shale, permafrost & rocky soil, the Amulet Ripper has taken the excavator attachment industry by storm. Fitting base machines from 2,000 to 100,000lbs., the Amulet Ripper has proven itself unbeatable under even the most extreme applications where most single point rippers fail. Amulet Ripper's are shipped "ready to work" complete with a replaceable Esco tooth. The Amulet GP, HD, and Severe Duty Buckets provide an unbeatable excavator bucket for a wide range of demanding projects. Available in various widths for base machines from 15,000 to 180,000lbs., these buckets get the job done time after time. Amulet Bucket's are available with Esco style teeth only. "COMPAIR TO THE ESCO BUCKETS"
The Amulet Tilt Bucket is fast becoming standard equipment for many excavator operators who have been waiting for a full feature tilt bucket. Amulet's unique design provides the machine operator the ultimate soil shaping and excavating attachment. The bucket tilts at 45 degrees each way and has twin, heavy duty, guarded, double-acting hydraulic cylinders. Bolt-on edges are available for all Amulet Tilt Bucket models. The The Amulet Ditch Bucket is the perfect choice for ditch clearing and excavating projects when a wider bucket is required for optimum efficiency and results. Available in various sizes and widths for base machines from 9,000 to 100,000 lbs., the Amulet Ditch Bucket is designed and built to last a lifetime.